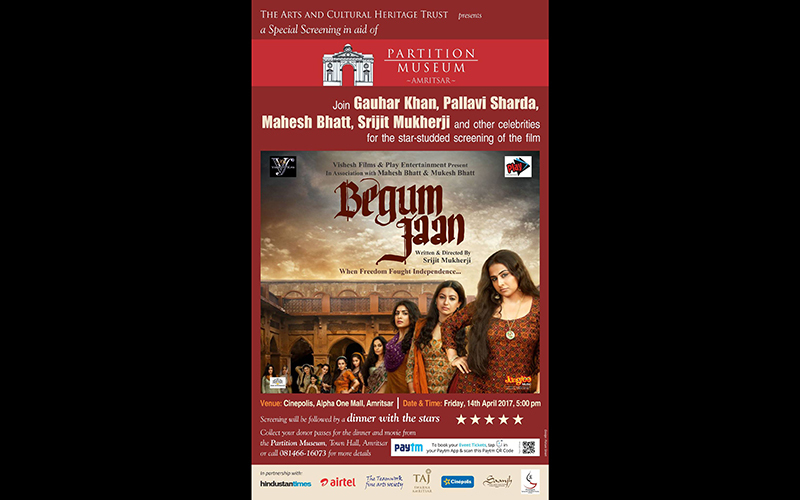 The Arts And Cultural Heritage Trust presents a special screening of the Movie, Begam Jaan at Cinepolis, Alpha One Mall, Amritsar. Date: 14 April 2017 5:00 P.M.
Come hear Gauhar Khan , Pallavi Sharda, Mahesh Bhatt and Srijit Mukherji give you the inside scoop on the movie! Followed by a special screening on the release date… This Partition-themed movie starring Vidya Balan Gauhar Khan Pallavi Sharda is sure to be an interesting way to spend your Friday evening! Limited passes are available for Rs 300/head at The Partition Museum, Town Hall, Amritsar– get yours before they are gone!